Audition preparation, master classes, private lessons. Click HERE to learn more. You will be challenged! But within your own comfort level. Click HERE to learn more. Speak with confidence. Get rid of those jitters faster and improve your breathing/posture. Click HERE to learn more. Jolee received her Bachelors Degree in music from Westminster Choir College in Princeton, NJ. She studied voice with Lois Laverty, and learned to effectively train students of all age from Helen Kemp. After college, Jolee studied with 3 students of Seth Riggs, learning his ground-breaking vocal technique. As a member of the Westminster Choir, she sang with the New York Philharmonic, Boston Symphony, Pittsburgh Symphony under the direction of Leonard Bernstein, Seiji Ozawa, Pierre Boulez and Robert Shaw. Audition and Speech Preparation, Master Classes and Private Lessons are available for students of all levels. You will find the studio a comfortable place to be yourself and to learn without fear. 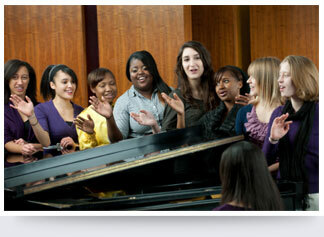 Students will learn to sing as a soloist as well as part of an ensemble. Sight-singing, ear-training and basic music theory will be part of each month's lessons so that each singer is a musician who sings well. Just being a good singer is not enough, you will be trained as musicians. While a student, she directed children's choirs and was the soloist at Hightstown Presbyterian Church. As a member of the Choir in Residence at the Festival dei Due Monde in Spoleto, Italy, she sang in the chorus of Cosi fan tutti, La Dame de Pique and soprano in Mozart's Requiem, to name a few. The purpose of the Vocal Class is to develop your voice so that you will be able to use your voice for a variety of musical endeavors with confidence and good tone-quality. This will be accomplished by working on vocal technique (with daily practice), including vocal exercises, breathing, posture, voice placement and diction. Copyright © 2013 Jolee Miller White. All the respective rights reserved.